Come 29 June, Grammy Award-winning international artiste, Jason Mraz, will grace the shores of Singapore with his Asian concert tour titled “Tour is a Four Letter Word”. This brand new tour in Asia celebrates the release of Jason Mraz’s hugely anticipated new album “Love is a Four Letter Word”. The Singapore stop marks a grand finale to “Tour is a Four Letter Word” in Asia! Known for his highly engaging ‘live’ performances, Jason Mraz’s previous concerts in Singapore were all sell-out shows and music critics the world over have often lauded his ‘live’ performances and his ability to charm the crowds. 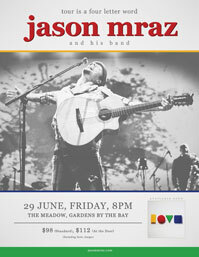 Jason Mraz will be the first artiste to ever perform at Gardens by the Bay, Singapore’s next iconic landmark, on 29 June. One of the modern era’s most gifted pop troubadours, Jason Mraz’s extraordinary musical journey has taken him from coffee houses to stadiums all over the world, with two GRAMMY® Awards and six nominations already to his credit. His 2008 third album, “WE SING. WE DANCE. WE STEAL THINGS.” was an indelible global blockbuster, earning gold, platinum and multi-platinum certifications in 21 countries around the world. The album’s lead single, “I’m Yours” was ASCAP’s 2010 “Song of the Year” and also holds the record for being the longest-running song in the history of the Billboard “Hot 100” chart. A prolific songwriter, Mraz has been feted with a number of honors, including the Songwriters Hall of Fame’s esteemed “Hal David Starlight Award,” presented to gifted songwriters who are making a significant impact in the music industry via their original songs. Mraz spent much of 2011 road-testing the songs from his as-yet-untitled new album touring alongside his longtime friend, percussionist Noel “Toca” Rivera. The worldwide trek – which included performances in North America, Africa, Europe, Asia, and Australia – saw Mraz celebrating music’s lasting power to inspire change and help others through global citizenship. Among the journey’s many highlights were multiple sold out shows at such iconic venues as Australia’s Sydney Opera House, New York City’s Carnegie Hall, and Spreckels Theatre in Mraz’s adopted hometown of San Diego. “Tour is a Four Letter Word” is the headline concert at Rhythm with Nature, a series of events collectively held as part of the official opening of Gardens by the Bay. The Meadow, located in the heart of Gardens by the Bay, is an outdoor lawn with a panoramic backdrop of the Gardens’ cooled conservatories, Supertrees and the city skyline. The Meadow provides an ideal venue for a great outdoor audio experience with an emphasis on crowd comfort while being in a lush green surrounding, allowing the audience to move around the spacious grounds while enjoying the music performances. D’Stress times ahead & a MUST attend show for the whole family!!! 12% off ticket price exclusive for mio TV and SingTel customers! SingTel Subscribers & mio TV Subcribers enjoys 12% discount! Ramli Sarip or PapaRock as he was affectionately called, is an iconic figure in the Nusantara music scene. Ramli shot to fame with his pioneering rock group Sweet Charity that was set up in 1967. His last concert with his band, Sweet Charity in 2009 at the Esplanade was a sold out. Generally accepted as the ‘father-figure’ by the artistes community on both sides of the causeway, this recipient of 1998 COMPASS Artistic Excellence Award is an all-rounder singer, musician, producer, composer and mentor. His last solo concert titled ‘Perjalanan Hidup’ was staged 27 years ago at the then World Trade Centre. SADAQA is therefore his first solo concert in almost 3 decades and the only concert for the year that is charity-based. With special guest artiste, Raihan, Ramli will perform songs from his latest album – SADAQA. 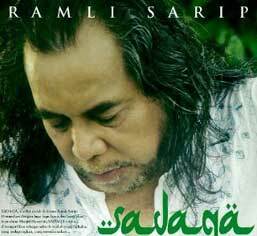 SADAQA features a compilation of 14 selected hits throughout Ramli’s solo career. SADAQA is in aid of Hasanah Mosque.